A Russian cargo ship loaded with 3.1 tons of needed supplies and equipment blasted off from the Baikonur Cosmodrome in Kazakhstan Wednesday and set off after the space station amid troubleshooting to figure out what might be done to free a jammed navigation antenna. The antenna, one of five used by the ship's KURS automated rendezvous system, apparently remains fully stowed, its support arm folded against the forward side of the cargo ship. "Russian flight controllers are assessing the situation and considering their options," Pat Ryan, NASA mission control commentator at the Johnson Space Center in Houston, said during a mid-morning update. n a pre-launch photo of the antenna and its support arm in their stowed positions it appeared the dish-like antenna, protected by white insulation blankets, possibly could interfere with the space station-Progress docking mechanisms. Ryan did not address any potential interference issues or what impact the glitch might have if the antenna cannot be at least partially deployed. 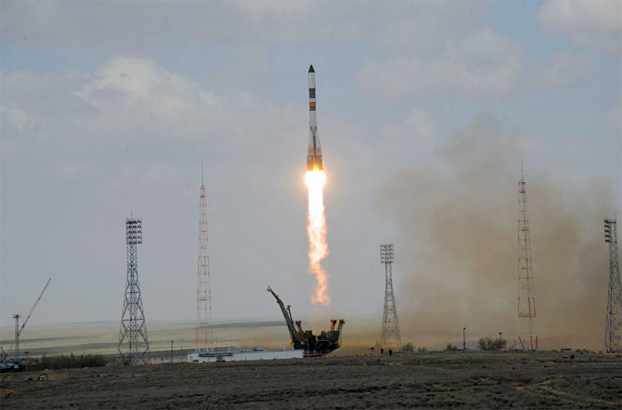 The Progress M-19M/51P spacecraft, perched atop a Soyuz-U rocket, took off from its Baikonur launching pad at 6:12:16 a.m EDT (GMT-4; 4:12 p.m. local time), roughly the moment Earth's rotation carried the pad into the plane of the space station's orbit. Climbing away through a blue sky dotted with low white clouds, the Soyuz rocket appeared to perform flawlessly and the Progress was released into its initial orbit just under nine minutes after liftoff. The spacecraft's two solar panels deployed a few moments later. IA few minutes after that, Russian flight controllers reported that antenna ASF2, part of the KURS rendezvous system, had failed to extend as expected. The KURS system, used by both Progress and manned Soyuz spacecraft, measures differences in radar signal strength to home in on the space station. For Progress flights, the station crew also can take over manual control if necessary and remotely guide the spacecraft to docking. 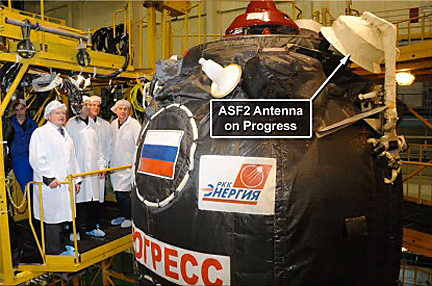 The stowed ASF2 antenna normally is used to measure the orientation of the Progress and its roll rate during final approach. "It is believed to be an issue with its release mechanism, a mechanical issue with the release mechanism," Ryan said. "A similar occurrence took place on the 31 Progress vehicle back in November 2008 when the antenna did not deploy properly. In that case, it worked itself loose by it's third orbit." After the third orbit of the Progress M-19M spacecraft Wednesday, "so far there's no indication it has shaken loose and deployed itself," Ryan said. "Russian flight controllers are continuing to assess the situation and considering their options for ways to get this antenna deployed." In the meantime, he said, "engine firings to fine tune the approach ... to the station are proceeding in parallel to the efforts to get that antenna deployed." The Russian space program has been testing single-day launch-to-docking rendezvous techniques in recent flights, but the Progress M-19M spacecraft was launched on a more traditional two-day trajectory, setting up a docking at the Zvezda command module's aft port around 8:26 a.m. Friday. The spacecraft is loaded with 1,764 pounds of propellant, 105 pounds of oxygen and air, 926 pounds of water and 3,483 pounds of dry goods, including spare parts, life support system components and science gear.